Our Exec Comp Aligned with ROIC Model Portfolio (+1.5%) outperformed the S&P 500 (-0.7%) last month. The best performing stock in the portfolio was up 19.7%. Overall, 8 out of the 15 Exec Comp Aligned with ROIC Stocks outperformed the S&P in December. Since inception, this model portfolio is up 20% while the S&P 500 is up 19%. Hurco Companies (HURC) is the featured stock in January’s Exec Comp Aligned with ROIC Model Portfolio. Since 2013, HURC has grown revenue by 9% compounded annually and after-tax profit (NOPAT) by 20% compounded annually to $26 million in fiscal year 2018. HURC has managed this profit growth by increasing its NOPAT margin from 5% in 2013 to 9% in 2018. Further highlighting the strength of its business, HURC has generated cumulative free cash flow (FCF) of $33 million (12% of market cap) over the past five years. ROIC was added to Hurco’s executive compensation plan in 2014 as a target goal for performance-based equity awards. In 2018, 35% of performance-based equity awards were tied to the firm’s three-year average ROIC. This focus on ROIC has led to Hurco’s ROIC improving from 8% in 2013 (year before ROIC was added) to 14% in 2018. Hurco’s exec comp plan lowers the risk of investing in the company’s stock because we know executives are held accountable for creating real profits. 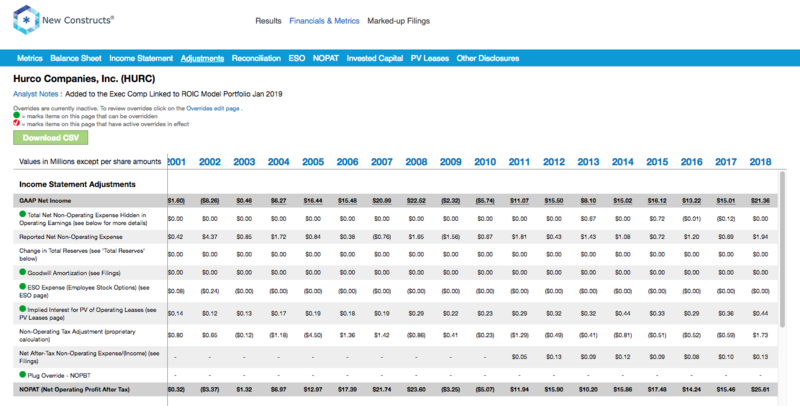 At its current price of $37/share, HURC has a price-to-economic book value (PEBV) ratio of 0.7. This ratio means the market expects HURC’s NOPAT to permanently decrease by 30%. This expectation seems rather pessimistic given Hurco has grown NOPAT 8% compounded annually since 1998 and 20% compounded annually since 2013. 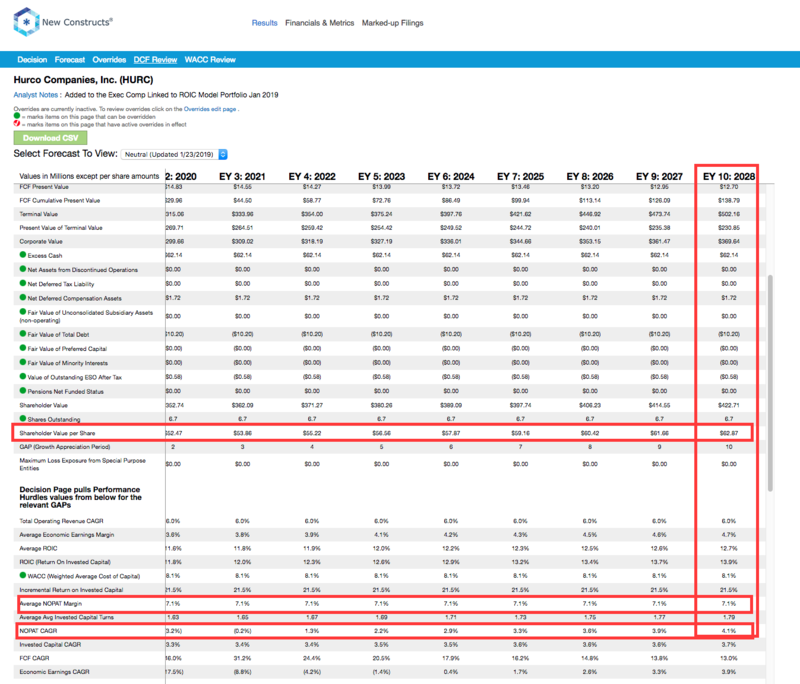 If HURC can maintain 2018 pre-tax margins (9%) and grow NOPAT by 4% compounded annually for the next decade, the stock is worth $63/share today – a 70% upside. See the math behind this dynamic DCF scenario. Income Statement: we made $6 million of adjustments, with a net effect of removing $4 million in non-operating expense (1% of revenue). 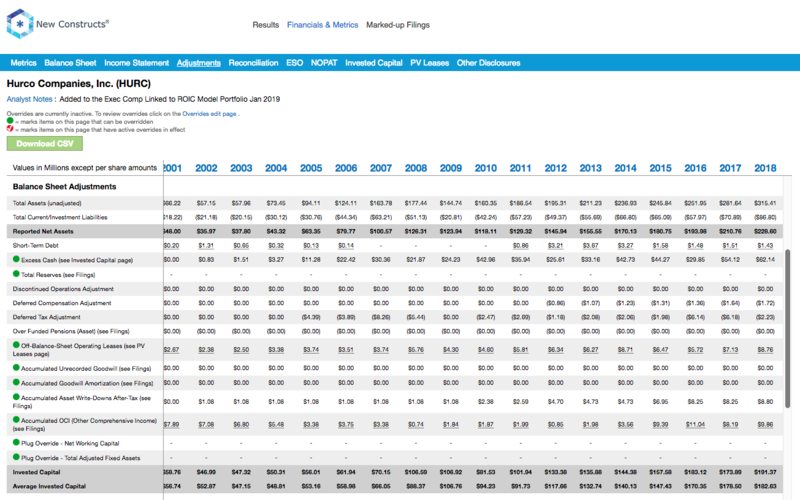 You can see all the adjustments made to HURC’s income statement here. Balance Sheet: we made $106 million of adjustments to calculate invested capital with a net decrease of $46 million. One of the largest adjustments was $11 million due to adjustments for other comprehensive income. This adjustment represented 5% of reported net assets. You can see all the adjustments made to HURC’s balance sheet here. Valuation: we made $75 million of adjustments with a net effect of increasing shareholder value by $53 million. The largest adjustment to shareholder value was $62 million in excess cash. This adjustment represents 4% of HURC’s market cap. Disclosure: David Trainer, Kyle Guske II, Andrew Gallagher, and Sam McBride receive no compensation to write about any specific stock, style, or theme.